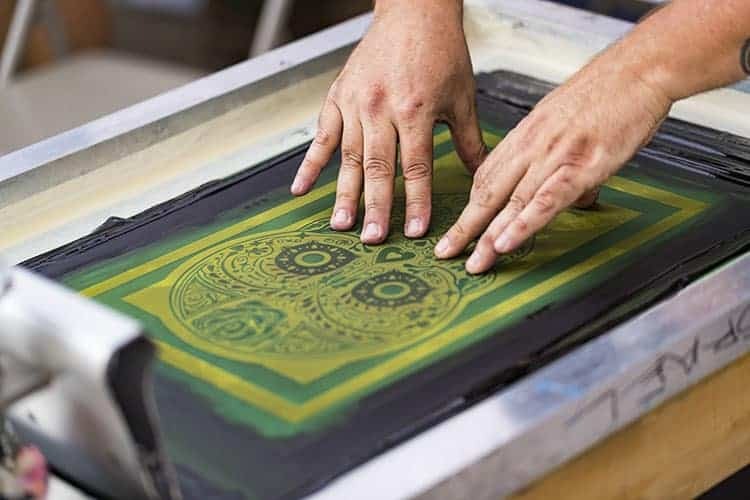 If you’re just starting out with your T-shirt printing business, you need to know all the different types of shirt printing methods out there. The technique you use will vary depending on the kind of fabric you need to print on, the volume of the job and the number of colors you intend to print. So the best way to print t-shirts will really depend on all those factors. Digital image processing software has made it easier than ever to come up with elaborate and intricate designs which have led to the birth of several new, modern printing techniques. But the old methods of heat pressing and screen printing continue to account for a bulk of the market. So without further ado, let’s get into the different types of printing. Find below a list of the best types of t-shirt print methods. Screen printing, also known as silk screen printing is the oldest and most popular form of printing out there. It has been around since before our time and is widely considered the professionals choice! Nowadays, it’s done both by machine and by hand. If you’re doing it by hand, you need a stencil and a nylon mesh. You make the stencil, holding it up with the nylon mesh. A waterproof material blocks out the negative space in between where you make your design. Ink is then flooded into the negative space, and you get your design. Remember to ensure that you only use high-quality inks so that they don’t fade away or look weird. If you want realistic, vibrant colors which stick around, use the best inks possible. Once you set it up, you can print a large number of shirts with the same design very quickly. You could print about 400 to 500 shirts with a single gallon of paint. Of course, there are other factors to consider, like how big the design, how much pressure is needed, the number of strokes, the mesh count, etc. But it’s still compatible with most fabrics, making it the go-to choice for most T-shirt printing companies. 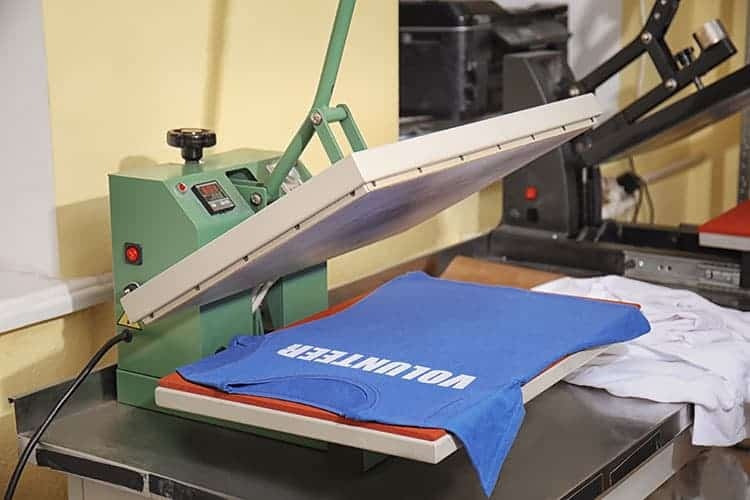 Heat press printing involves laying sheets of transfer material on top of a shirt and then permanently transferring the design graphics from the layer onto the shirt. Here are 5 great ideas on how to decorate your t-shirts with a heat press. 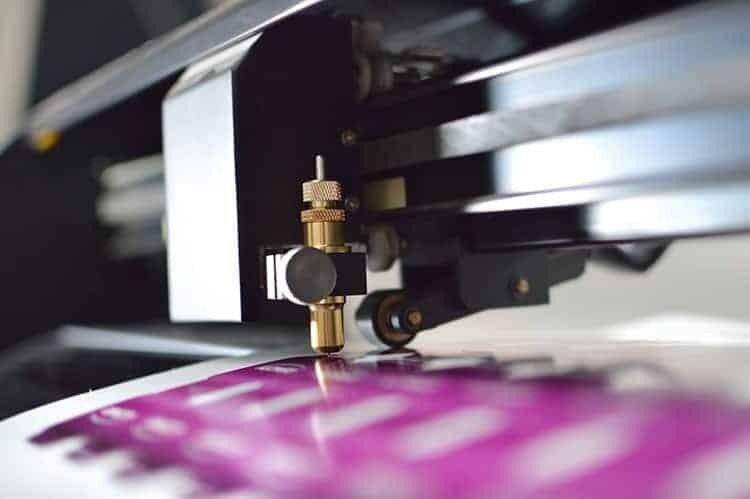 If you wish to get started with heat press printing, you will need to purchase a good quality small-business heat press machine, as well as some t-shirts and some HTV vinyl. It works on different materials and fabrics. It creates no mess whatsoever and requires minimal maintenance. The only downside is that they don’t work well with dark fabrics. And if you want to do large amounts of printing, it could be time-consuming to make. It is really important to use the best heat transfer vinyl to ensure that your graphic will remain looking new wash after wash. 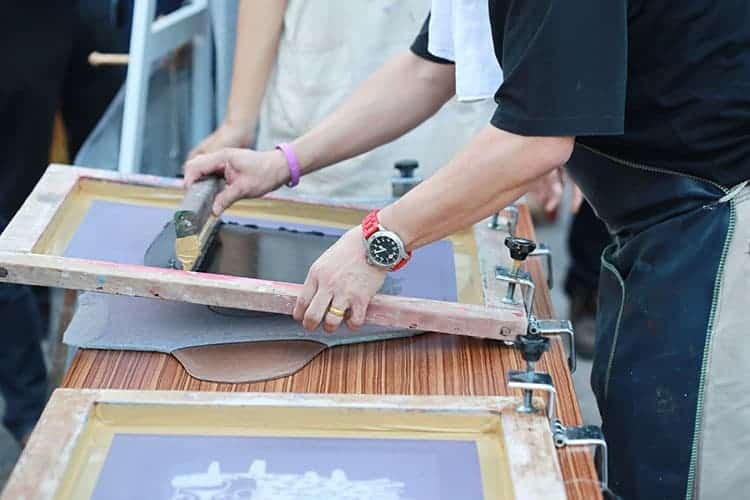 Most small-business owners choose to either use screen printing or heat pressing due to the low cost involved in setting up. 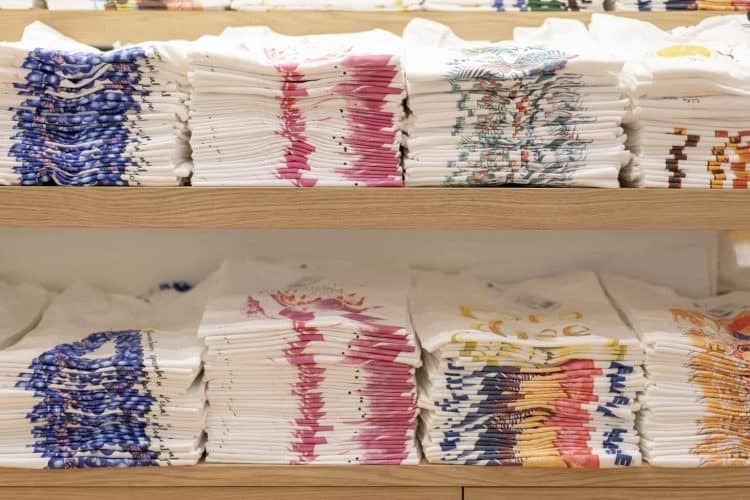 DTG (Direct-to-Garment) Printing is an inkjet technology that lets you print high-quality, photographic prints with vibrant colors directly onto a t-shirt. When you want complicated, intricate designs, this is quite frankly your best option. DTG printing machines have a vast color mixing potential allowing them to print even the tiniest details. The traditional methods usually have limited colors, and complex patterns turn out weird, if at all. All you need is a textile printer and ink. Picture a standard office printer, but the ink is going on the t-shirt and not on a piece of paper. All that’s required is the technical know-how to work one of these printers and to create the digital graphic on an image processing software. The print on the shirts feels very soft as compared to other methods, as they do not pile on extra layers of material. You won’t get the ‘print’ feeling when you touch it as ink is directly injected into the fabric. If you’re printing 1 to 5 shirts, this is the best option because all you have to do is load the shirts into the textile printing machine and it will print it on the shirt in less than 30 minutes. There’s no need for the elaborate setup process involved in setting up a heat press or a screen printer. The downside is that these machines can be very expensive. And you wouldn’t want to get a cheaper one, as that will compromise the resolution of the print. Also, DTG prints tend to be less durable, and the print will fade in a year or two. Dye sublimation is the print of choice for polyester fabrics and works best on light colors. Absolutely unsuitable for cotton, it does a great job on polyester making prints that will last a lifetime. This requires a special dye which dries up on the polyester fabric. When it has dried enough, it turns into solid on the fabric. After that, you apply heat and pressure for sublimation. By the application of heat, the solid turns into gas which then slips into the empty space between the fabric molecules. When you remove the heat, the gas solidifies again, this time inside of the fabric of the t-shirt. It’s best because the gas becomes part of the polyester itself and not just a layer on top. It’s also the best choice for shirts which are printed all over. The print does not crack, peel or fade away with time. The only two downsides are it works only on polyester shirts. The more polyblend, the better the print will look. Also, it does not come cheap. Maybe not a transfer method directly, but vinyl cutters are fabulous pieces of equipment to have to help take your transfer work to the next level. A machine is used to cut out these designs (letters, logos, etc) on pieces of colored vinyl. Think cutting out a paper into a certain shape. It’s the same concept. 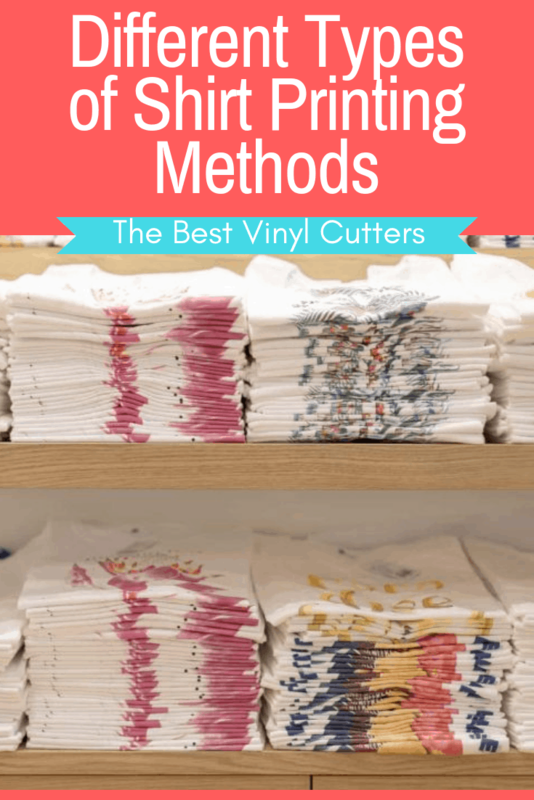 These cut pieces of vinyl are then transferred onto a shirt using a heat press method. It’s essentially putting a small layer of vinyl on top of the shirt, like the logo of a sports team. Vinyl cutting is best suited for producing one-off designs and then transferring these designs onto multiple pieces of clothing. The only downside is you can only make simple graphics out of it, otherwise, it’s going to take a long time. In conclusion, the kind of printing technique you should use depends largely on the complexity of the design, the kind of fabric it’s going to be printed on and the number of shirts that need to be printed.